Okay! I said I’d post my own goals for the coming months and here they are! Remember, these goals serve the overall “vision” statement I made in my previous post. If you haven’t read that post, you should. 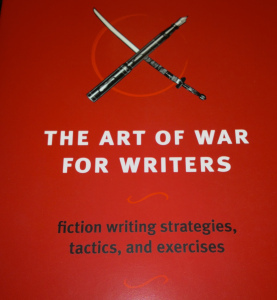 It explores novelist and writing teacher James Scott Bell’s The Art of War for Writers and focuses on Bell’s thoughts on the importance of goal setting for writers. I will complete for submission one non-fiction picture book and one fiction picture book before August 31. I will complete one new screenplay while revising a new draft of a current project by August 31. Complete research for my new non-fiction picture book by April 31. Complete a first draft of this new non-fiction book by May 31. Revise for submission to my agent a current draft of my new fiction picture book by April 31. In order to complete one new screenplay this year, while revising a new draft of a current screenplay project, I will. Collect notes on my current project and complete revisions by June 31. Map out a new project and complete a first draft by July 31. Designing a program of self-study to address them. I had a breakthrough moment last month when I discovered the idea of “deliberate practice.” It helped answer questions I’d been having about how to improve as a writer. I think I’m good, but I know I have a long way to go and I wasn’t sure what the best “plan” would be. I knew simply writing was better than not writing, but I was wondering if I could be more strategic. For example, when there is a new technique I want to learn on guitar, I break it down into component parts and practice. Could this be done with my writing? This idea of “deliberate practice” comes from the field of expertise studies, which basically looks at how people get great at what they do. To find the answer, researchers have studied high-achievers across the disciplinary spectrum in such fields as music, chess, art, writing, sports, etc. They’ve found something fascinating. In study after study, researchers find no evidence to support the idea that “talent” is a prerequisite for success. Talent, as Colvin suggests, is overrated. On the other hand, just working hard isn’t going to make you great either. Bell suggests you build your own Writing Improvement Program by identifying exemplars you admire and using them as guides; seeking out and assimilating comments on your work; and by creating a self-study plan to overcome your weak areas as a writer. But if you’re like me, you want to know more. So this is what we’re going to talk about next! If you’re curious, check out this great post by Victoria Strauss and Barbara Baig at the Science Fiction and Fantasy Writers of America website. Until next post, start making your dream a reality by casting your vision and setting some goals!